Securing subscribers for your email list is great, but increasing engagement from your email marketing campaign (using clever email template) is the ultimate goal. Increasing engagement leads to improved conversion rates at every stage of the sales funnel. Take the Taleo corporation as an example. They reported an additional 30% of visitors converting to qualified leads, thanks to the power of lead nurturing emails. It requires preparation and thought. Stagnant email campaigns won’t get you conversions. To increase your ROI, you must craft emails to trigger engagement. Then you can watch the sales roll in. As Gartner Research reports, you can increase your revenue by at least 10% within 6-9 months of using automated email campaigns to interact with your subscribers. Here are some helpful tips, tricks, and proven best practices to persuade subscribers to get involved with your business by utilizing the below email template techniques. All emails are judged by their subject lines. If the subject sounds spammy or uninteresting, your emails will be relegated to the trash. Worse, 69% of email recipients send emails to their Spam folders solely based on their subject line. It is no exaggeration to say: The fate of your email marketing campaign lies on the subject line. Keeping subject lines to 40 characters or less isn’t just easier for your reader’s eye, but it also means the full subject line will appear on mobile devices instead of the annoying ellipsis (...). A subject line that says “Thank God It’s Friday!” is less effective for getting an open than a simple “TGIF!” according to Constant Contact. If your emails are displaying an authentic sender name, it is more likely to be opened. Receiving an email from “Frank at (name of company)” appears less like spam and more like legitimate correspondence. If you are using an automatically generated sender name like “Jin Jo <[email protected]>,” you are asking to be labeled as junk mail. Segment your subscription list and send the same email, only with a different subject line, to each list. Once deployed, you can analyze your data to see which email obtained the highest open and click-through rates. Second only to subject lines, email body copy plays a vital role in triggering engagement. Smartphones have rewired brains to crave instant gratification and, according to some sources, have even diminished attention spans down to a paltry 8 seconds. That is less than that of a goldfish. Nobody has the patience for wordy, long-form email body. No one. Like I just did there. Because no one has time for nonsense. Here’s an example from Uncommon Goods. Note how the copy uses various fonts, font sizes, and emphasis to grab your attention and make for easy scanning. The sentences are short, to the point, and even include a bit of humor. At first glance, email copy should be simple, easy to read, and visually appealing. Images should load rapidly. And properly. No one is going to wait around for your picture to load. Literally. You have mere seconds to make an impression. A staggering number, about 43% of people, prefer to access emails through mobile devices. Triple-check to ensure your copy formats properly on all device types. Not sure how to do that? Use a testing service such as Litmus. Litmus allows you to input your email template into their system and, with the click of a button, it checks that it will format properly across different mobile devices, browsers, and operating systems. If your copy fails the Litmus test, you can adjust your email according to their suggestions and re-test. Once your email passes, you can send your email knowing it will be perfectly viewable for customers regardless of which device or browser they are viewing it on. We’ve all heard these popular adages over the years. They are popular because they are pithy and TRUE. When a subscriber opts in to your list, they do so because they are intrigued by your business. And also because they want something out of it. 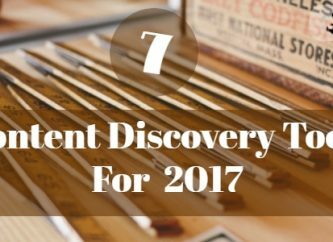 They are likely expecting to see discounts, reminders, and valuable content in their inbox. Give them what they want. That’s what they signed up for. If you don’t meet their expectations, expect an unsubscribe. A well-timed welcome email complete with discount code works exceptionally well. The incentive and thoughtfulness will likely win you your first sale from the customer. Check out these examples from Wistia. They do a fantastic job of grabbing attention, making the new subscriber feel welcome, and encourages them to return to the site without being pushy. There must be a value exchange with every email. Subscribers are spending their valuable time reading your emails. Compensate them for it. In addition to traditional discount codes, consider offering eBooks, whitepapers, or other types of content which give value to your relationship. Attractive offers lead to improved click-through rates of up to 34%, transaction rates by 27%, and general revenue by almost 50%! Disclaimer: Don’t saturate your emails with offers. Maintain a high demand for your business by invoking scarcity and personalizing offers to subscriber needs. Social media is a prime way to increase engagement. A report by Statista shows 81% of people in the United States alone have social profiles across various mediums. 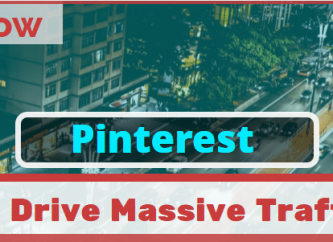 What you may not realize is that you can obtain peak social media engagement through email marketing simply by including active icons and incentives. Be blunt and ask subscribers to share your email offers in their newsfeeds. 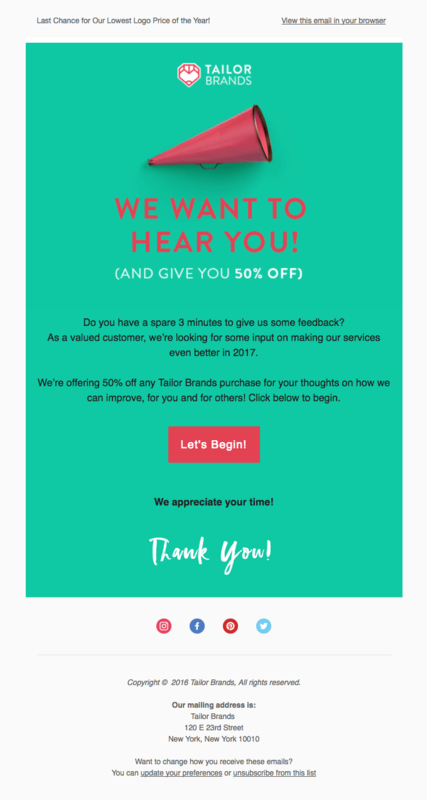 One idea: Send a 10% discount code to your subscribers, but increase that to 15% if they share a link on their newsfeed. Sweeten the offer by throwing in free shipping if their followers subscribe to your list from the link. 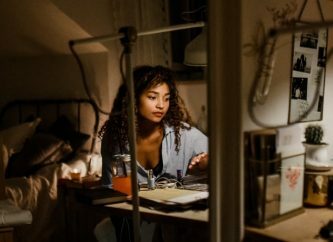 Not only does this increase engagement rate, it also puts subscribers in a position of being a brand ambassador AND multiplies the size of your audience with ONE EMAIL. An obscure call-to-action is the same as no call-to-action. Effective CTA’s are clear, visible, and actionable. They are a “fast pass” to take readers to your website instantaneously. The call-to-action used by Square is short, visually distinct, uniquely shaped, and action-oriented. Perfect. One other piece of advice: make sure your landing page loads quickly. No one is going to wait around for your information to appear. Everyone likes to feel special. When marketing email campaigns are done correctly, they address individual problems based on location in the buyer's’ journey. If they are browsing, show them products they may be interested in. If they abandoned their cart, give them an incentive (and link) to return and complete the purchase. If it’s their birthday, send a gift. People open emails appearing to be written with them in mind. Sending one-size-fits-all emails to your list is a fast pass to spam. Personalization is easy with list segmentation through email automation software such as Triggmine and Ninja Outreach. Segment subscribers into lists by location in the buyer’s journey and regularly adjust based on purchasing behavior. This information is easy to obtain through website analytics or data gleaned from pop-up forms tastefully embedded into your site through conversion rate optimization (CRO) software like Sleeknote and Picreel. When an emergency hits, adrenaline takes over. There are mere seconds to make a decision, and one can only hope it is the correct one. Creating a sense of urgency in marketing emails improves ROI by forcing conversion. It incorporates basic psychology and applies the same principle used in successful infomercials. Consider adding a deadline or product countdown in your next email. Doing so forces the subscriber’s brain to act fast - or risk losing out. Including a “buy one get one” offer for a limited time in your email template exponentially increases the odds of converting a lead to a sale. The company Edible Arrangments saw an 8% boost in same-day orders when they sent out an email with an embedded timer. 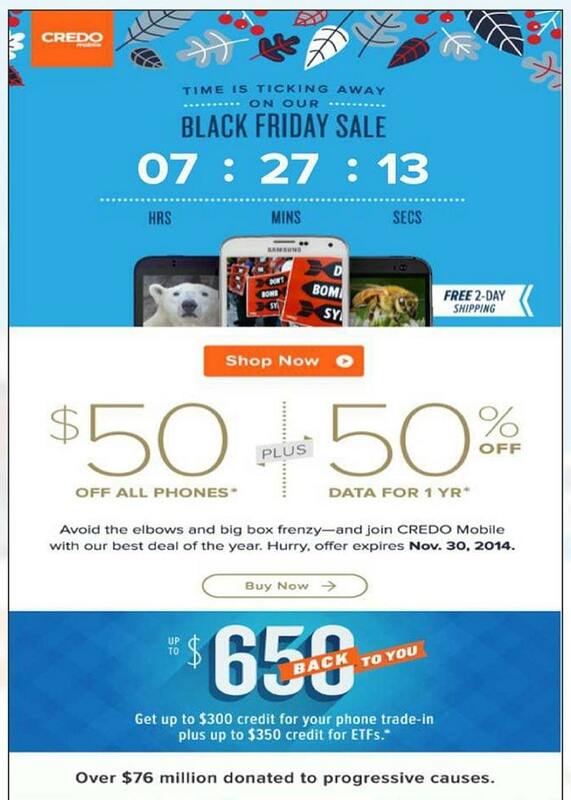 Credo Mobile sent two emails as an A/B test, one with a countdown and one without. The email with the countdown timer received a 14% higher click-through rate. Be vigilant that 53% of emails are opened on mobile phones as per a Litmus report. With so many people checking their email on smartphones, it is essential that your messages are optimized for a wide variety of devices. Even more alarming is according to Fortune magazine, within the next two years, there will be 2 billion iPhone users. New Apple Mail updates place an unsubscribe link front and center of each email. It is more important than ever to make sure emails are optimized for the mobile viewing experience if you wish to increase engagement. Always assume subscribers are viewing your emails on their phone. They are in a hurry after all. Frame your content accordingly. 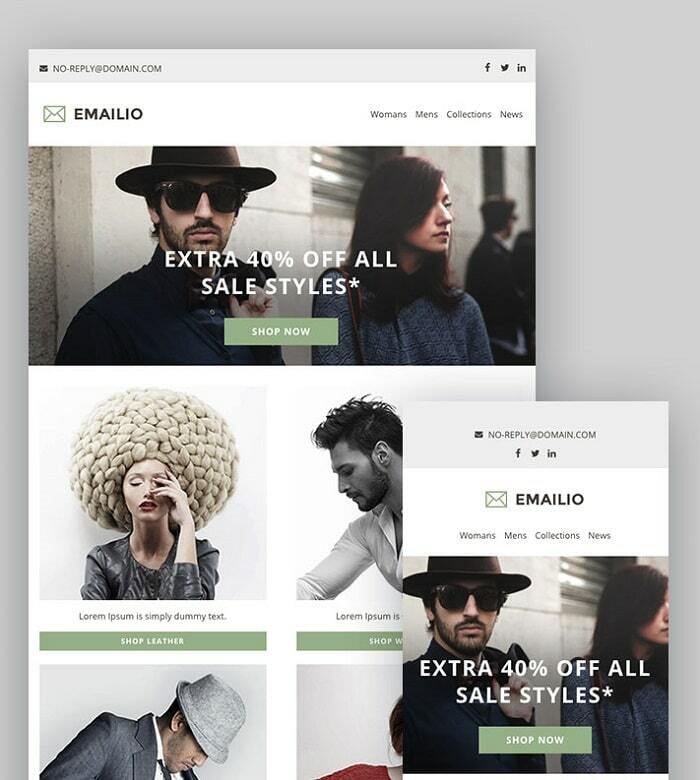 Offer a consistent look and feel to your emails. You have a brand. A philosophy. A mission statement. So make sure your emails broadcast that image. 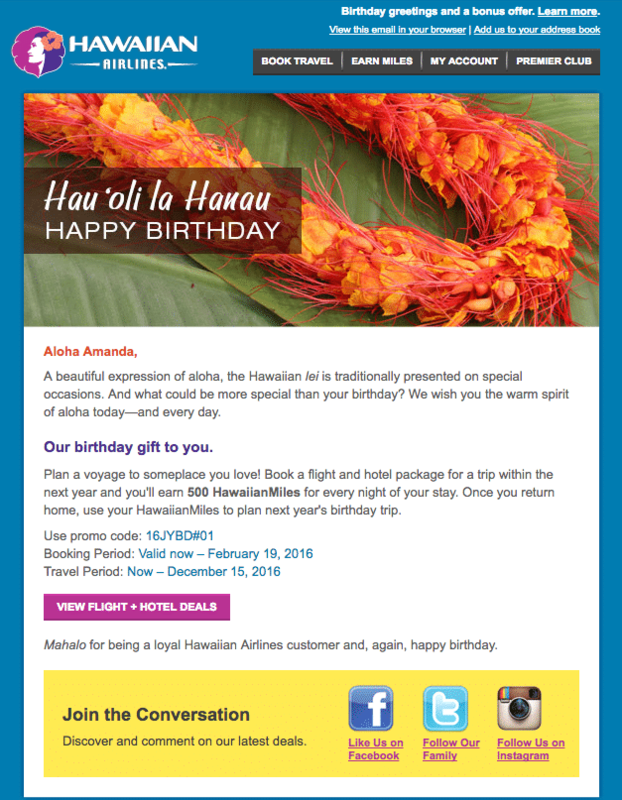 Maintaining a consistent design to your emails offers a sense of familiarity to subscribers. They begin to recognize names, logos, and color schemes both within and outside of their inbox. Brand consistency in email marketing goes a long way in nurturing your relationship with customers. People respond best to familiar brands and products. Especially in post-purchase follow-up emails. Over time, if the style of your emails is maintained, recipients will respond to the familiarity, making them more likely to open, click, purchase, and return. Surveys are a tremendous way to glean insights into your customer’s psyche. Surveys can identify weakness in email campaigns and marketing strategy so you can improve upon them in the future. Email marketing should be in a constant state of progression and evolution. Small tweaks and adjustments can make all the difference in keeping readers engaged. Listen to subscriber feedback and make the requested changes. By reacting to your subscribers’ feedback, you are illustrating the value they hold in your relationship. Interacting with subscribers is key to ensuring a lasting relationship and increasing engagement. If your car won’t start, do you immediately assume the engine has failed? You first check the gas, fuses, and other small-ticket items before you assume the worst. The same goes for email marketing. You can try all the tricks in the book, but first, check the basics. Putting thought and preparation into your email marketing campaign will reap countless rewards. Put yourself in your customer’s shoes and consider what attracts them to businesses in your industry. With a bit of effort, you will see engagement (and conversions) steadily increase over time. Tonya is a Content Manager at TriggMine, email marketing automation service. She believes that email marketing rules and content is the king.